Discover state-of-the-art products and services that can increase your company’s productivity, achieve operational efficiencies and boost profitability. 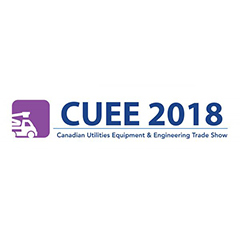 With over 100,000 square feet of indoor and outdoor exhibit space, CUEE showcases over 45 different categories of products and services relevant to the utility sector. Register now to attend CUEE 2018 on September 11-12, 2018 at the International Centre in Mississauga to ensure your company is keeping up with the latest industry trends. Visit the CUEE’s website here. This entry was posted in 2018 Shows, Show Resources, Trade Shows and tagged 2018, back wall, banner stand, Canada, Conference, Custom exhibit, Design, Displays, Exhibits, expo, fabric displays, Fabric Exhibits, Marketing, Show Services, toronto, trade show display, trade show displays, Trade Show Exhibits, Trade Shows. Bookmark the permalink.